Comedy based on the hit Edinburgh Fringe show of the same name. It is an exploration of politics under the guise of a girls' night out. Get a Round is based on the hit Edinburgh Fringe show of the same name, made by the Manchester-based trio Eggs Collective, who make sharp, fun, culturally observational performances that fall somewhere in the cracks between theatre and cabaret. This is an all-singing, all-dancing performance with a bit of slapstick thrown in for good measure. They explore feminism and connection through the way they see the world and what they find funny. They write, perform and produce all of their own work. 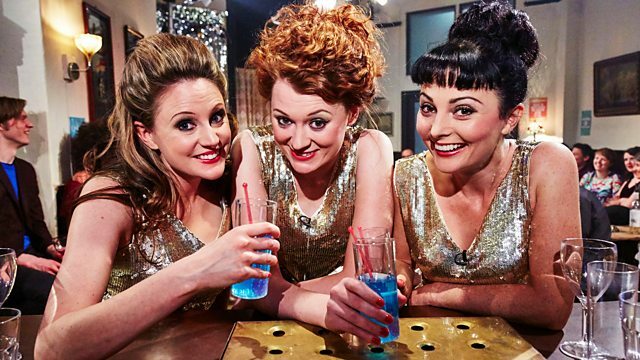 They are Sara Cocker, Lowri Evans and Leonie Higgins. The show is an exploration of politics under the guise of a girls' night out. In the face of continuing bad news and an increasingly divided and unequal Britain, this show asks how we can get through such confusion and look after each other in times of difficulty. It has been specially adapted for television as part of the Performance Live Strand. Through exploring the middle ground between live performance and television, this strand of programmes challenges audience perceptions around what live performance can be.